*By Julia Kindt, Professor, Department of Classics and Ancient History, University of Sydney. In a time and place that offered few career opportunities for women, the job of the priestess of Apollo at Delphi stands out. Her position was at the centre of one of the most powerful religious institutions of the ancient world. The competing Greek city states had few overarching authorities (political or otherwise), so the significance of her voice should not be underestimated. Indeed, there is some evidence to suggest that the Pythia was at the core what we today call a “knowledge economy”. Her role may well have involved the gathering, re-packaging, and distribution of information, with the ultimate intent of providing sound advice on the trivial and not-so-trivial questions of life in the ancient world. The “Pythia” is the official job title. We know of several women by name who, during the long history of this institution (from ca. 800 BCE to AD 390/91), held that role, including Phemonoe and Aristonike. Indeed, at some stage Delphi became so busy that three Pythias were appointed to serve in the role simultaneously. The oracle was consulted by the movers and shakers of the ancient world on a diverse range of problems. For the Pythia, this meant the opportunity to comment on a variety of issues of public and individual concern: cult matters, warfare, the relationships between existing city-states, and the foundation of new ones. Numerous personal questions were also put to the oracle on matters of lovesickness, career advice, child birth, and how to get offspring. So, by all standards, this job was demanding yet also diverse and rewarding — a position powerful enough to change the course of history. Yet right from the beginning, efforts to deprive the priestess of her power prevailed, particularly in older classical scholarship. Surely a woman, especially one in such a paternalistic society as ancient Greece, could not hold that powerful a position? Some scholars suggested that the Pythia actually babbled unintelligible gibberish and that her words were later put into beautiful, deep, and meaningful hexameter verse — by male priests. Yet in our ancient sources there is absolutely nothing to suggest that it was anyone other than the Pythia herself who came up with the responses. To the contrary: she is regularly named as the one and only source of the prophecies delivered at Delphi. There is no word of male priests, beyond those in purely administrative and assisting roles. The position of the Pythia seemed to have entailed the extraordinary opportunity to speak unwelcome truth to those in power. A Spartan once approached the oracle with the intention of being confirmed as the wisest man in the world. In response to this question the Pythia named another person who was wiser. The Greek city of Megara allegedly asked the Pythia in about 700 BCE who were the best of all the Greeks, hoping to be named first. The Pythia mentioned two better cities , concluding with the line, “[Y]ou, o Megarians, [are] neither third nor fourth.” Surely, the Megarians did not see that coming! This kind of reality check and straight talk would certainly have upset those with egos accustomed to flattery and agreement. Of course, it is not always possible to tell whether these and other responses of the oracle were authentic or whether the whole incident was part of later historiographic lore. Yet whatever the case: the fact is that it was a woman who was attributed such a sharp, judgemental voice. And her voice proved extraordinarily unimpeachable. The Greeks thought that it was the god Apollo who conveyed his superior divine knowledge through the mouth of the Pythia, so the priestess herself was largely beyond reproach. While itinerant seers, augurs, and oracle mongers feature in classical literature as corrupt and unreliable, the position of the Pythia seems to have stood above all criticism. Being a Pythia was not always easy. Several ancient enquirers sought to influence the kind of answer they hoped to get from the oracle. Subtle manipulation in how the questions were put, not-so-subtle bribery, and even an attempt to force the oracle to deliver responses on a non-auspicious day are all on record – as are complaints about unfathomable responses. For instance the Greek historian, philosopher, soldier, and horse whisperer Xenophon allegedly enquired at Delphi to which deity he should sacrifice and pray so that the military expedition he was about to join would be a success. He was later reprimanded by the philosopher Socrates for having posed a manipulative question. Socrates felt he should have asked whether it would be a success, rather than how. Cleisthenes was said to have bribed the Pythia to deliver the same response to all Spartan requests at the oracle, no matter the question: to free Athens from the rule of tyrants. And after a series of spectacular mishaps based on misread oracles, the Lydian king Croesus complained at the Delphic Oracle about having been misled. The Pythia responded that he himself was to blame for his misfortune: He should have interpreted the Pythia’s word correctly. We also know of several instances in which the Pythia refused outright to respond to a question that, in one way or another, seemed unreasonable. What did it take to become the Pythia? Was she a local girl from a neighbouring village? Was any kind of training provided to candidates? Or were they thrown in the deep end? Unfortunately, the ancient sources are silent. The Nobel prize-winning author William Golding in his (posthumously published) last novel The Double Tongue, written from the perspective of a Pythia, sees her as a local girl who was unable to get herself married and so took on that role. Yet again, this sounds like speculation designed to downplay the position. The kind of skills required to be successful in the role are easier to reconstruct. The sanctuary of Apollo at Delphi served as a marketplace for representatives from all over the ancient Greek world (and beyond) who came for a variety of reasons. In addition to the oracle, the sanctuary housed regular athletic competitions (the so-called Pythian Games, analogous to the more famous Olympic Games). With its numerous temples and monuments, the site was also a popular tourist destination. All these activities together served to establish a busy hub, where information, news, and gossip of all kinds would have circulated freely. 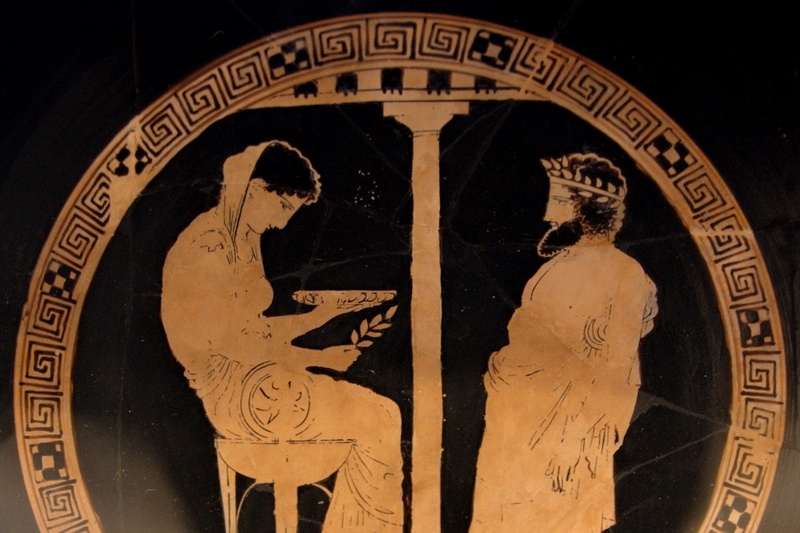 So perhaps the key to the Pythia’s success was simply to listen closely? There is good evidence to suggest that the fantastic tales of prediction and fulfilment are a matter of the (later) historiographic tradition and that it was mostly quite straightforward questions of everyday life that were put to the Pythia for comment, along the lines suggested by the ancient author Plutarch, who was also a priest at Delphi: Will I win? Shall I marry? Is it a good idea to sail the sea? Shall I take up farming? Shall I go abroad? If this was indeed the case, it would, more often than not, have been possible to glean the information necessary to answer any particular enquiry from the chatter of those queuing to consult the oracle, to watch or participate in the games, or to take in the monuments. The Pythia may have trailblazed the knowledge economy millennia before the arrival of “big data” and the invention of the internet. Will you Support The Pappas Post for as little as the cost of a cup of coffee per month? Is The Pappas Post worth $5 a month for all of the content you read? On any given month, we publish dozens of articles that educate, inform, entertain, inspire and enrich thousands who read The Pappas Post. I’m asking those who frequent the site to chip in and help keep the quality of our content high — and free. Visit our Patreon page and start your monthly support today. When you become a Patron, you’ll also join an exclusive group of supporters that will have access to additional content and special offers that will be created just for you.